EB9: why does gender pay equity matter? 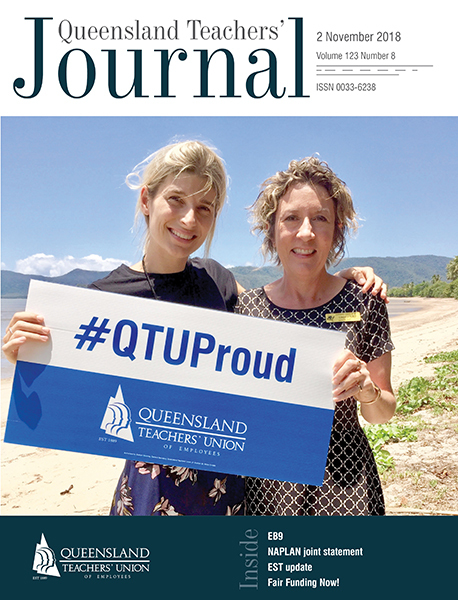 Gender pay equity (GPE) is set to be a key plank of the QTU’s EB claim in 2019 – but given that we have had equal pay for decades, why is this so important? Well, while the QTU secured equal pay in the early '70s and our salary structure does not include a “woman’s” wage, or a “man’s” wage, discrepancies still exist. In 2016, the Queensland Public Service Commission reported that the then Department of Education and Training had an earnings gap of 9.1 per cent (PSC, MOHRI, active/paid head count June 2016). So how is GPE such an issue in a government agency like education? The gendered wage gap is demonstrated in the following ways. Disproportionately, women have broken (unpaid) service due to caring responsibilities. This may be because, in many cases, women are the full-time carers for infants, young children and elderly family members, and access unpaid leave to fulfil these duties. These breaks in service interrupt their superannuation contributions, often during a time when the compounding nature of superannuation is crucial. Breaks in service also impact on promotional opportunities, access to professional development and the roles and responsibilities provided to women in a school environment (we’ve all seen and heard anecdotally about women not being given certain year levels, subject choices etc as they are “going on leave…” or “working part-time…” etc). Finding the capacity to access professional development and maintain curriculum and system currency while on unpaid leave (and undertaking important care responsibilities) is often a real struggle, and further compounds the nature of the disadvantage, how the employee is perceived, and their confidence. When returning from care roles, women often return part-time, which limits promotional opportunities and the rate at which they progress up salary banding, with women often taking twice as long to reach senior teacher (ST) and experienced senior teacher (EST). As we know, these salary bandings are reliant on the number of years on each salary scale/step. Currently, all teachers, including part-time teachers, must work 200 days, or a full year, before they progress to the next salary banding. A 0.5FTE teacher must work two years to have a salary move; despite working and planning, and reporting for a full year. Part-time work attracts less superannuation benefit. There is a very real culture of resisting part-time employment in the department, and the lack of visible part-time women in promotional positions, especially high banding positions, reinforces this culture. Therefore, women who need to access part-time are resistant to apply for promotional positions that attract higher incomes. There remains a massive gender imbalance in promotional positions, especially in the higher paid (SES) roles, despite women being roughly 76 per cent of the profession. Paid parental leave cannot currently be shared between partners who both work within the department, reinforcing the culture of women disproportionately being the primary carer. It is to be noted that this is often to the detriment of men and partners who wish to take on a greater role in parenting and caring responsibilities. GPE is informed by the fundamental principle that gender should not have an impact on the income, opportunities and financial wellbeing of employees and must be minimised. That’s why closing the gender pay gap is a priority. As a feminised union representing a feminised employee group, it is essential that we explicitly seek to improve conditions in this round of negotiation and make real, systemic and long-term gains to our industrial conditions. That is why GPE is part of our log of claims.